KARATCOIN IS THE FUTURE OF GOLD CRYPTO ASSET. Join now the most profitable and exciting ICO of 2018. Don't Miss our ICO, it's a Great Opportunity! Our objective is to create a groundbreaking organization that blends the centralized and decentralized worlds perfectly. Our ambition is to create a multipurpose project destined to become a major market player that embraces constant and evolutionary growth. There are no geo-restrictions, once the gold has been turned into crypto-gold, you can redeem it in any country*. Costs related to transport and related taxes are minimized by leaving the raw material in its place of origin. You can safely store Physical Gold asset in vault and keep it as Gold Certificates in your wallet on the Karat Blockchain, the gold is safe from political influence and will preserve and increase its value over time. Fees will be used as returns for stakeholders instead of miners. This means a faster validation block time (10 secs), less power consumption and more security. Karatcoin is less volatile than other crypto-currencies because it’s indirectly linked to a real asset with an owned blockchain. Gold Certificates are safe investments. Our Certificate gives you 2 half-yearly coupons with up to 6% interest. Vote for the gold mines to be financed and participate to the active interests that will be perceived from funding given to the selected mines. to buy and sell gold. Our goal is to build a platform to trade gold certificates, exchange Karatcoin tokens, as well as save and exchange currency using gold cards. Our team is up to build a secure, useful, & easy-to-use product based on private blockchain on top of EOS technology. It will include easy cryptocurrency payments integration, and even a digital arbitration system. At the end, Our aims to integrate all refineries, gold companies, and business assets into a unified blockchain ecosystem, which will make business truly efficient, transparent, and reliable. Karat Blockchain uses DPoS consensus (Delegated Proof of Stake) that allows for better performance, and less power consumption than any other blockchain consensus. Karatcoin uses the Delegated Proof of Stake (DPoS) consensus for quality control efficiency. DPoS allows delegated block producers and voters to sustain the network for content distribution. The delegates are in charge of validating transactions and relaying blocks. Voters can also monitor the uptime to ensure participation in block propagation. Delegates that get “voted out” no longer receive rewards and voters are incented to participate by receiving a part of the rewards. All transitions are stored in a public ledger inside the Karat Blockchain, and all asset documents are stored as images in the IPFS (Interplanetary File System) to guarantee their immutability (thus giving everyone the opportunity to check and verify them). Files uploaded on an IPFS server are permanent due to their unique identifier but become persistent once the files are shared over the network and are kept in use through pinning. From our product portfolio customers can maintain a form of savings as well as an investment in cryptocurrencies. That investment is suited to their individual needs, from the most aggressive who want to trade our cryptocurrency, to the most conservative that wants to accumulate a safe-haven asset like gold. Additionally, in order to beat inflation, our customers will be protected by our Certificates that have both a fixed maturity and semi-annual coupons paid in KCG. Our products will be available in a marketplace developed inside our blockchain, and it will also be the first to have a comprehensive product portfolio along a DPoS consensus that will allow a triple advantage in validation speed, safety, and rewards for cryptocurrency holders. Karatcoin will create a decentralized gold market application by enabling established gold traders and providers to tokenize the same metal under one crypto-asset token, generating a highly liquid and stable market. Communicate Straight to the Blockchain within the Web. Our vision is to create a people-powered new economy decentralized financial services ensuring both in stability investments and aggressive investments linked to market fluctuations and fueling the collateral needed for future projects and at the same time create an ecosystem for developers to utilize Karatcoin tokens as a framework for various Ðapp developments, thus accelerating adoption of blockchain technology. The Karat Foundation seeks to support community and civil society organizational initiatives that aim to ensure benefits are enjoyed by all miners, while also ensuring that any negative impacts are avoided or minimized. "Working conditions are very poor, as production systems are generally obsolete and inadequate"
"Many children work with their parents in such activities as extraction, hauling ore, crushing and grinding the ore, and mercury amalgamation"
"The work done by children varies according to the type of mine from which ore is being extracted"
"In the worst cases, children are being held in slavery-like conditions"
"These children perform all sorts of low-skilled tasks, including amalgamating the gold using mercury"
"Poor living and working conditions mean that all young children are exposed to infections and diseases"
"Unclean water and lack of sanitation and complicated by malnutrition, malaria, meningitis, measles, tuberculosis..."
"Children in these areas are out of reach of international relief organizations and continue to risk being recruited into militias or forced to work in mines"
"In addition to being exposed to mercury, children face various other health problems, kidney and urinary tract diseases..."
"Children extract soil in a murky environment with zero visibility wearing crude eye masks and breathing oxygen from a tube with the help of a compressor"
The Karat Foundation will be established in accordance with the UN Guiding Principles on business and human rights, especially conducting better control and surveillance work to ensure that gold is sourced responsibly and ethically. DAO members can contribute by voting for projects (gold mines and profitable financial projects) they consider deserving. These votes, together with the due diligence made by the foundation's finance office, will provide for the gold mining to be managed responsibly, with substantial economic benefits for the countries and their populations. The Karat Foundation will operate autonomously supervise and check that the quality parameters are respected and will not have direct control on the operations and external works of the members. 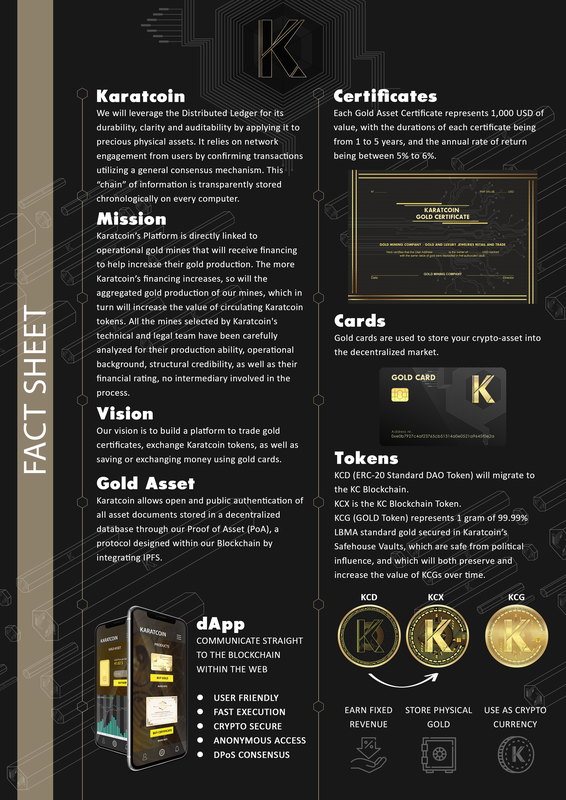 Karatcoin offers a decentralized loan product for eligible members, known as the Karatcoin Loan (KCL) through a smart contract issuing KCX (Karatcoin Blockchain Validation Tokens) with a financial term that are tailored to the needs of the purpose of the financing or the member country’s overall debt management strategy. The foundation, in the context of its social work of facilitated finance for selected small/medium gold mining companies, will continuously monitor progress and achievements to bring benefits between stakeholders of the foundation and the gold mining companies. Borrowers of Gold Mine, benefit from medium/long maturities (up to 10 years), transparent pricing, built-in hedging products to manage financial risks over the life of the loan, and the ability to customize repayment schedules according to project needs or debt management requirements. Members of the foundation will benefit of interest income from financing. To increase aid to mines, fundraising campaigns will be launched through online platforms, events and conferences will be organized as well as organizing lunches and gala dinners. Karatcoin tokens will be offered as a prize for participation in individual events. Each charitable action will set precise objectives to be achieved and quantify the sum necessary to pursue this goal. If the established amount is collected, the prize offered will be extracted. Karatcoin (ERC-20 Standard Token) will be released on the basis of Ethereum platform. It’s compatibility of the token with third-party services wallets, exchanges etc., and provides easy-to-use integration. Karatcoin will launch a public ICO to distribute Karatcoin DAO (ERC-20 Standard) tokens with a bonus that starts at 16%. The price that users get depends on how early they buy in. Start of the Karatcoin Platform Development. Karatcoin has an experienced and enthusiastic team of who are ready to make this project a reality. Karatcoin allows open and public authentication of all asset documents stored in a decentralized database through our Proof of Asset (PoA), a protocol designed within the EOS Blockchain by integrating the IPFS (Inter Planetary Files System) to trace the entire authentication path through its chain of custody. When will start the Karatcoin ICO? There's no date set yet but as you can view from our roadmap is already programmed for the 3rd quarter of 2018 after a successful presale. Can I be advised before the ICO starts? Yes, you can subscribe here with your email, we will advise you 2 weeks before the ICO starts. Can I partecipate to the presale? The presale is for private investors only that are accredited on CoinList. This is a list of who can participate: •Company with assets of $5M or more •All equity owners of my company are accredited investors •All equity owners of my company are qualified purchasers Accredited investors are: •Accredited investors meet standards defined by the US Securities and Exchange Commission which allow them to invest in certain private securities offerings. The SEC web site contains the full definition. In general, any of the following would meet the standard: •Individuals with annual income over $200K (individually) or $300K (with spouse) over the last 2 years and an expectation of the same this year •Individuals with net assets over $1 million, excluding the primary residence (unless more is owed on the mortgage than the residence is worth) •An institution with over $5 million in assets, such as a venture fund or a trust •An entity made up entirely of accredited investors And qualified purchasers are: •Qualified purchasers as defined by the US Securities and Exchange Commission are individuals with at least $5M in investments or funds with at least $25M in investments. How much will cost a Karatcoin? KTC is a cryptocurrency digital gold. Crypto value that is secure from political influence and will preserve and increase its value over time. KC is also a fast and comfortable means of payment with a worldwide scope, and it's private and anonymous enough to serve as a means of payment for several markets and any other economic activity. •Offered Token exchange ratio: 1 KCD=0.1 U.S. dollars •KCG (GOLD Token) is a stable crypto-asset that represents 1 gram of 99.99% LBMA standard gold secured in Safehouse Vaults; the gold is safe from political influence and will preserve and increase its value over time. How much will cost a Gold Certificate? Each Gold Asset Certificate represents $1,000.00 of value. The duration was determined as follows: • One year and the return is an annual rate of 5%; • Two years and the return is an annual rate of 5,25%; • Three years and the return is an annual rate of 5,50%; • Four years and the return is an annual rate of 5,75%; • Five years and the return is an annual rate of 6% . Advantages • The rates will be paid every six months until maturity date of certificates; • Gold Certificates and Coupons refer to unallocated asset; • No Gold Asset storage fees applied; • All certificates hold in a Cold Storage Wallet, when the certificates mature they can be redeemed. What is exactly your PoA (Proof of Asset)? Proof of Assets (PoA) is a scheme designed to let entities (operators) prove they control a given amount of asset certificates blockchain based. The PoA Asset consists of the following information permanently uploaded onto the decentralized database (the Blockchain): •SKU of the Gold Bar made by the Authorized Vault; •Bar Serial Number made by Refinery; •Chain of Custody Digital Signatures (the Gold Mining Company, Custodian, Auditor); •Audit Documentation; •Depository Receipt made by the Authorized Vault; •Certificate creation; •Time stamp of Certificate creation; •Certificate Signature; •Certificate serial number. Can I beat inflation with Karatcoin? How my gold is safe? Physical gold asset is stored in the global refinery vault, after buying it you will receive a document certifying it. What is the Karat Gold Certificate? • Real savings account; • Coupon every six months with good interest rates; • Decentralize the wallet: Gold + Cryptocurrency; • Protect the investment with high value stability*: Gold + Dollar. What is the Karat Gold Card? • Send and receive gold as payment; • Start from 1 gram to rise in line with the investment; • Gold can be redeemed by users on the blockchain; • The minimum investment will be 50,00$ and therefore accessible to everyone. I want to offer my collaboration, can I send my CV? Yes, we're hiring! Please click here for more info. We are very responsive in our service. Contact us if you would like to know more about our offerings and how we can work together. Have a presale question about our products and features? Or looking for a partnership? We would love to hear what you concern is. Don't miss out, Stay updated on our ICO. Copyright © 2018 Karat Lab. Subscribe now, be always updated on our latest news. We are currently running a small sale for people who have expressed early interested in the project. GET A 30% BONUS NOW!